David M. Edelstein's "Over the Horizon"
David M. Edelstein is Associate Professor in the Edmund A. Walsh School of Foreign Service and the Department of Government at Georgetown University. His first book is Occupational Hazards: Success and Failure in Military Occupation. In the 1920’s, European great powers confronted what I call now-or-later dilemmas. For Britain, this meant deciding whether to attempt to constrain a revisionist Germany now or put off the costs of doing so until later. For Germany, it meant deciding whether to act more aggressively to reclaim its interests now or delay any revisionism until later. Unexpected levels of cooperation between Germany and Britain emerged out of the way in which each state chose to resolve their dilemmas. Britain was too focused on short-term economic challenges to address the potential long-term threat of Germany while German Foreign Minister Gustav Stresemann understood that early aggression would undermine long-term German goals. This historical detail is relayed on page 99 of Over the Horizon, and it encapsulates the more general argument made in the book. Temporal dynamics have been an underappreciated dimension of international politics. States respond differently to long-term threats and opportunities, and in particular, surprising levels of cooperation between existing and emerging great powers can be explained by the time horizons of political leaders. One implication of the argument is that states have incentives to try to manipulate the time horizons of the leaders of other states. On page 99, I describe how Stresemann attempted to offer reassuring signals to other European leaders about the benign nature of German intentions. Whether or not those intentions were sincere and whether or not they would have persisted over the long term is less consequential, then that they contributed to an environment in which other European powers felt comfortable alleviating the pressure that that Treaty of Versailles had placed on Germany. The argument has implications for how we think about contemporary rising great powers, including China. In the two decades after the end of the Cold War, Chinese grand strategy was motivated by the idea of laying low and avoiding provocations in order to allow China to continue to grow unimpeded. For a combination of domestic and international reasons, China has acted more assertively in the last few years. Patience was a virtue for China, and its emerging impatience may have dramatic consequences for the future of great power politics. 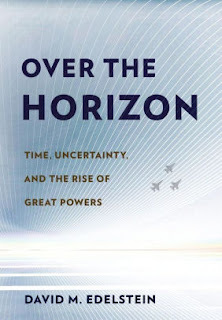 Learn more about Over the Horizon at the Cornell University Press website. The Page 99 Test: Occupational Hazards. 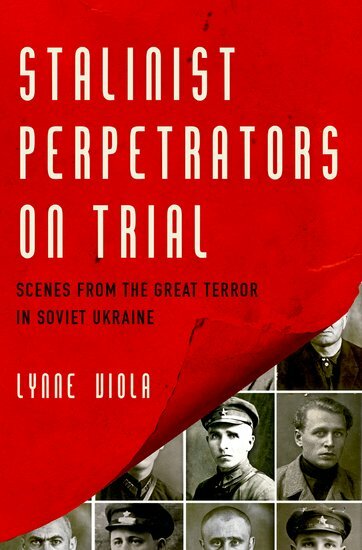 Lynne Viola's "Stalinist Perpetrators on Trial"
Lynne Viola is University Professor at the University of Toronto. She is the author of The Best Sons of the Fatherland: Workers in the Vanguard of Soviet Collectivization, Peasant Rebels Under Stalin: Collectivization and the Culture of Peasant Resistance, and The Unknown Gulag: the Lost World of Stalin’s Special Settlements. On page 99 of Stalinist Perpetrators on Trial, we find ourselves in Room 21 of the Uman NKVD offices in Ukraine. A nightmare unfolded in this small, multi-ethnic town in the course of 1937 and 1938 during Stalin’s “Great Terror.” Here, the local NKVD organs created a special “laboratory”—Room 21—for interrogations, beatings, and forced confessions. According to the NKVD indictment against the Uman NKVD perpetrators, “the task of this so-called laboratory...was to obtain from prisoners confessions about their supposed counterrevolutionary activities...Almost no one did not confess...20 to 30 people were called simultaneously into the room [for preliminary interrogations]...”. Those who “confessed,” were transferred to formal interrogation sessions; those who did not, were beaten until they did. What happened in Uman was repeated, in variations of technique, across the Soviet Union. A select group of NKVD perpetrators were subject to arrest at this time. They were charged and placed on trial throughout the country. This “purge of the purgers” allowed Stalin to avoid blame for the terror as well as to wipe out various clientele networks within the NKVD. NKVD cadres blamed for “violations of socialist legality” were interned in the Gulag or subject to execution. On 7 December 1941, the new NKVD chief Beria would request permission from Stalin to free from the Gulag 1,610 former NKVD cadres punished in the “purges of the purgers” so that they could fight in the war. The criminal files of these purged NKVD cadres, now declassified in what was formerly the Ukrainian KGB archives, allow us, for the first time, to enter the world of the Soviet perpetrators, following them into the darkest recesses of the terror, including the interrogation rooms, the prison cells, and the execution chambers. 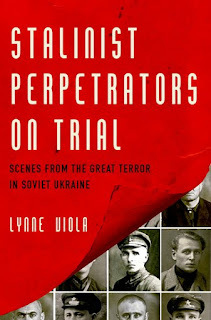 Learn more about Stalinist Perpetrators on Trial at the Oxford University Press website. The Page 99 Test: The Unknown Gulag. Michael Patrick Cullinane's "Theodore Roosevelt's Ghost"
Michael Patrick Cullinane is Professor of U.S. history at Roehampton University, London, and the author of Liberty and American Anti-Imperialism, 1898–1909, and coauthor of The Open Door Era: U.S. Foreign Policy in the Twentieth Century. Alice and Ted presumed that they could preserve a particular memory of their father's legacy, but it was the Democratic Roosevelt who captivated public attention and redefined "Rooseveltian." Historian Richard Collin argues that Franklin's presidency relegated TR to the position of a "forgotten man," that FDR produced a "historical obliteration" of TR, but this claim does not ring true. Franklin eclipsed Theodore, and Henry Pringle's critical biography certainly revised the historical impression, yet TR endured, even thrived, in public memory. FDR and Pringle changed TR from a "unique, isolated" presidential icon "beyond confusion with anybody else" into a puzzling figure with a political association with Franklin. Hardly obliterated, TR's ghost adapted and remained pertinent in a new context. When asked to open my book to the 99th page, I worried and wondered what I would find. But, true to the hypothesis of that magic number, the 99th page does not disappoint. One of TR's greatest admirers was his cousin Franklin who, soon after TR's death, began mimicking his most famous oratorical phrases such as "Bully" and "Dee-lighted." Franklin's campaign for vice-president in 1920 was characterized by a wholesale invocation and co-option of his dead cousin's popular memory. TR's family detested Franklin for this, particularly his eldest daughter Alice and eldest son Ted who spent their lives attempting to discredit FDR's reinterpretation. Chapter 4 of Theodore Roosevelt's Ghost, where page 99 falls, examines the ways in which Franklin changed popular conceptions about the name "Roosevelt." It is an example of how the past is re-imagined, and it exemplifies the purpose of the book. Theodore Roosevelt's Ghost is an analysis of a character that haunts American history. Every president has invoked TR; you can find his likeness carved into Mount Rushmore, in the performance of Robin Williams in Night at the Museum​, or as a giant bobble-head racing around National's Park in the intermission of the fourth inning of a Senators' game. Theodore Roosevelt endures as a figure with substantial meaning, be it for politics or pop culture. The page 99 test has exposed one of several historiographical contributions. The rise of FDR did not erase TR from memory; it merely changed perceptions. The changing nature of TR's posthumous image closely follows the historical context of the American Century. The Great Depression launched FDR's career and focused greater attention on TR's progressive legacy. It did not obscure the Rough Rider, however, and when the Cold War prompted a surge in nationalism and anti-communism, TR's legacy as an advocate of Americanism re-emerged. The contemporary green movement has reminded a new generation of TR's conservation credentials. Likewise, personal agency played a role in shaping his legacy, as FDR demonstrates. Other individual stories come to light in the book, such as the rationale for Mount Rushmore and the person responsible for TR's place on the mountain (spoiler: it was not the artist Gutzon Borglum, but Peter Norbeck). 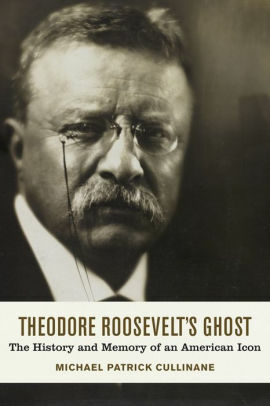 Theodore Roosevelt's Ghost​ details the most important commemorative activities over a century of relentless depictions with the aim of showing how memories of the past are used to serve the present. Learn more about Theodore Roosevelt's Ghost at the LSU Press website. Rachel Fulton Brown's "Mary and the Art of Prayer"
Rachel Fulton Brown is associate professor of history at the University of Chicago. She is the author of From Judgment to Passion: Devotion to Christ and the Virgin Mary, 800–1200 (2002) and coeditor of History in the Comic Mode: Medieval Communities and the Matter of Person (2007). This is the experience that my book attempts to capture for modern readers, but here, at the end of chapter 2, we have already come as far as most modern studies of the medieval devotion have been able to take us. We know by this point that every medieval Christian who could read—man, woman, or child; clerical, religious, or lay—would have known the Hours of the Virgin, the text at the core of their prayer books. We have also learned what we can about their experience of praying to her from the accounts that they gave of saying the invitatory antiphon at the first of these Hours and repeated by many throughout the day: “Ave, Maria, gratia plena, Dominus tecum.” Above all, we have noted, they reported sensations of lingering sweetness and exhilarating joy. Where—other than in their desire to exercise their onomastic skills—did they get the idea to read the scriptures in the way that they did, as filled with names for her, almost none of which (other than her actual name) were invoked by the evangelists Matthew, Mark, or Luke? The puzzle has been a persistent one ever since the eighteenth century, when philosophes like Casanova and Voltaire ridiculed interpreters like Sor María de Jesús de Ágreda (d. 1665) for imagining Mary as the Mother of Wisdom, filled with the knowledge of creation as God, the maker of heaven and earth, prepared her to be the temple of his Incarnate Son. The answer, as the remaining chapters of the book set out to show, lies in rethinking the history not only of the devotion to Mary, but of the origins of Christianity itself, grounded as it was in the recognition of Jesus not just as the Christ, but as the Lord worshipped in the psalms—and of Mary as the Mother of the Lord, the Lady of the temple in which the Lord became visible to the world. It is on page 99 that the full dimensions of this mystery first become clear and the doors of the temple begin to open wide. 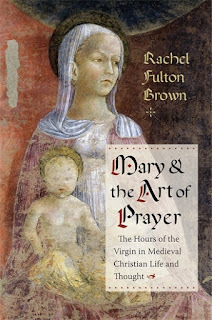 Learn more about Mary and the Art of Prayer at the Columbia University Press website, and visit Rachel Fulton Brown's blog. Daniel Siemens is professor of European history at Newcastle University. 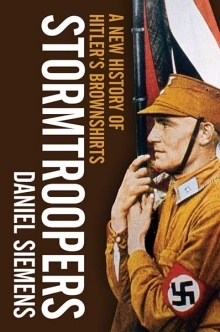 His new book is Stormtroopers: A New History of Hitler's Brownshirts. He is author of three previous books and has published widely on European and U.S. history of the nineteenth and twentieth centuries. This call is from an advertisement that ran in the early 1930s. It was directed at the rank and file Stormtroopers, or Brownshirts, the paramilitary wing of the Nazi party. Hitler and his followers had not yet taken power in Germany, but they were already a political force to reckon with. As I demonstrate in my book, the Nazis were not only skilled propagandists which since the late 1920s successfully reached out to a wide variety of German voters, they were also open to new business models. They centralized the sales of their uniform, of party badges and flags – similar to today’s sports clubs who make a fortune with cheaply produced shirts that bear the name of prominent athletes. 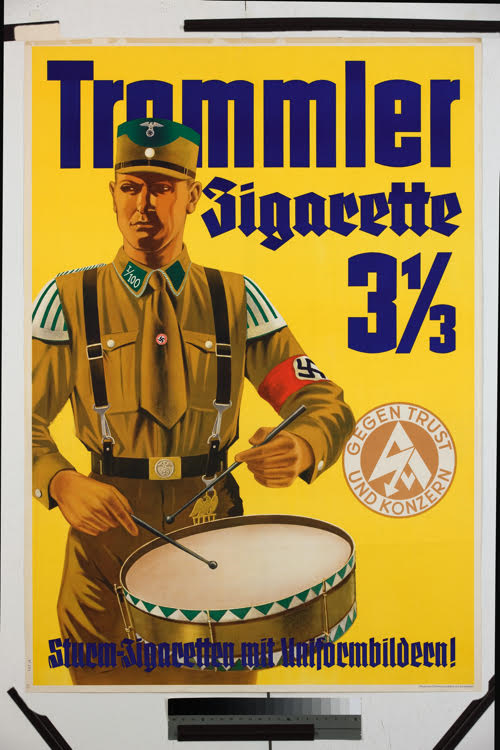 The NSDAP also cooperated with a Dresden-based cigarette company that produced a variety of cigarettes exclusively marketed to appeal to Nazi supports. It was a win-win situation: The party promised to order its quickly growing number of paramilitary supporters to smoke this particular brand of cigarettes, and in return the company employed Stormtroopers as salesmen and paid a share of its profits to the paramilitaries. What is more, such a cooperation fit with the Nazi propaganda of the pre-1933 era which accused big business and cartels to sell out the interests of the German workers. 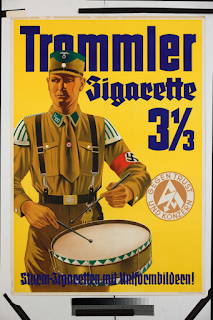 After the ‘Night of the Long Knives’ in the summer of 1934 that cut the Stormtroopers of much of their previous influence, this business model quickly collapsed to the benefit of the traditional big players in the German cigarette business. Yet the idea that group identity and feelings of belonging can be stimulated by the consumption of specially tailored products has proven a great success ever since. Learn more about Stormtroopers at the Yale University Press website. Jeanne Guillemin is senior advisor at the Security Studies Program in the MIT Center for International Studies. Her books include Anthrax: The Investigation of a Deadly Outbreak (1999); Biological Weapons: From the Invention of State-Sponsored Programs to Contemporary Bioterrorism (2004); and American Anthrax: Fear, Crime, and the Investigation of the Nation’s Deadliest Bioterrorist Attack (2011). Hidden Atrocities is a book about how, with covert US intelligence intervention, Japanese World War II war crimes involving germ warfare were suppressed at the post-war Tokyo tribunal, the very trial where victims ought to have been vindicated. The Chinese delegation was convinced that the Japanese attacked four of their cities with plague in 1940-1941 and had told the world so. On page 99, it is March 1946 and a team of American prosecutors from the tribunal’s International Prosecution Section is about to set off on a month-long investigation in China for trial-worthy evidence. There is still time to select Japanese defendants and develop charges against them. But can David Nelson Sutton, the Virginia lawyer assigned to structure China’s case, penetrate the wartime secrecy that surrounded the Japanese-caused epidemics, which were passed off as natural outbreaks? As the reader is already aware (but Sutton and his team are not), in the name of national security and using its own channels of inquiry, US Military Intelligence is avidly pursuing former Japanese military scientists who organized the plague attacks, along with campaigns using anthrax, cholera, typhus, glanders and other infectious diseases against Chinese civilians. On page 99 the tension is established between the ideal of criminal justice—that solid evidence should lead to the just punishment of wrongdoers—and the political forces that can corrupt the judicial process. The Tokyo trial, unlike the Nuremberg trial which took barely a year to complete, lasted for more than two years, with many stops and starts. Eleven nations had judges and prosecutors there: the United States, Great Britain, Australia, Canada, New Zealand, China, France, the Soviet Union, India, and the Philippines. By April 1948, when the trial proceedings ended, many opportunities for introducing evidence about Japanese germ warfare crimes, including years of systematic human experimentation on Chinese captives, had passed with no initiative from the United States, the United Kingdom, or the Soviet Union, each of which might have acted on information they chose instead to repress. 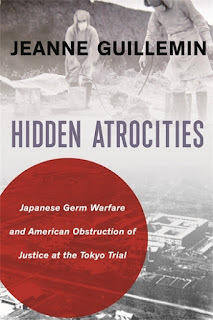 In the 1970s, revelations about Japanese germ warfare crimes finally began to emerge, after the United States abandoned its once enormous biological warfare program and began to declassify its records. In the 1990s, the Japanese and Western media were revealing the full range of atrocities, backed by belated confessions from Japanese military men who in their youth had been complicit in them. In China, increasingly open to the outside world, activists for the victims brought law suits against the Japanese government, but without significant results. Japanese judges decided that terrible germ warfare crimes had taken place, causing great suffering and death, but refused compensation or apology. The failure to prosecute these crimes in Tokyo left what seems a permanent injustice. In 1946, Japan and China were both wrecked by war, with broken economies. Today the two are major powers, with a legacy of unresolved war crimes still troubling their relations. Is any resolution possible? Perhaps, as some have argued, there is a role for an official Japanese apology, one in which the United States could participate—and finally honor the thousands of nameless victims ignored at the Tokyo trial. Learn more about Hidden Atrocities at the Columbia University Press website. The Page 99 Test: American Anthrax. 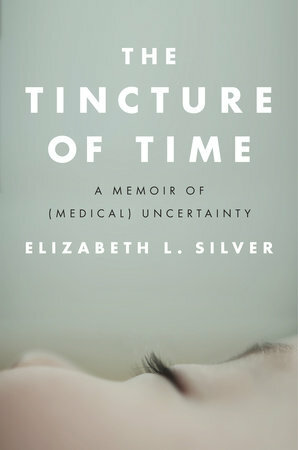 Elizabeth L Silver's "The Tincture of Time"
Elizabeth L Silver is the author of the memoir, The Tincture of Time: A Memoir of (Medical) Uncertainty, and the critically acclaimed novel, The Execution of Noa P. Singleton. I’m in the waiting room of the first neurosurgeon’s office about to find out the results from Abby’s first outpatient MRI. There is a large screen showcasing an aquarium scene, stretching from floor to ceiling. We get free water with the logo of the office printed on the bottles. It is hours after Abby has awakened from anesthesia. She is cranky but not terribly so. I wait for an extra hour. It’s OK. These are neurosurgeons. Pediatric neurosurgeons. Nothing I do will ever be as important—not in writing or in law. I wonder if other doctors feel impotent comparatively. Still, I know that this pediatric neurosurgeon is just a person. He is not a God. He’s a meticulously well-trained technician, and yet I wait for his answers the way a penitent stands outside a confessional hoping for absolution. While I wait, the termites of guilt return. Hospitals are infested with them, as are waiting rooms. Page 99 represents the theoretical core of the book, in that it is a book about waiting, about wondering what the future may hold, and learning how to navigate that unknown terrain – specially with respect to medical crises. This page opens on a section exploring waiting rooms in hospitals, doctor offices, therapists’ offices, and any place where life is forced to the periphery for a moment. It is the place of temporariness, it is a place filled with anxiety and possibility. This short excerpt is taken from a hospital waiting room, where we await results from a brain MRI for our infant daughter and must speak with a pediatric neurosurgeon about the results as soon as we are called back from our soft chairs in the waiting room. Everything in our lives will lead up to the short conversation we know we will have when called back, but in that moment in the waiting room, life and its mysteries can take any form it likes. There are no answers yet, and it is this place of emotional stasis that intrigued me as a writer, a person, a parent. What does it mean to wait – to be forced to wait or to embrace the waiting? In so many ways, this makes us human. My Book, The Movie: The Execution of Noa P. Singleton. 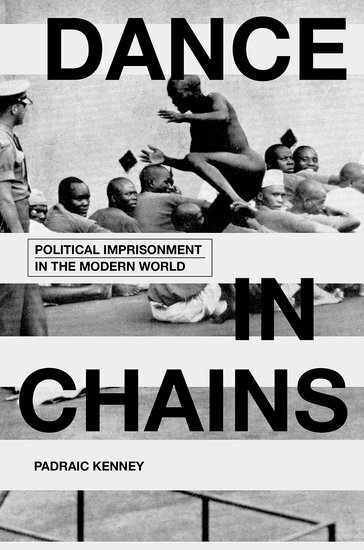 Padraic Kenney's "Dance in Chains"
Writing about the experience of political imprisonment, I examine a wide variety of actions that prisoners engage in, ranging from communal education to hunger strikes. One of the hardest activities to write about is escape from prison. It is challenging to discuss, as I do on page 99 of Dance in Chains, because the motives are so simple: anyone who is confined against his or her will should want to get out. But in the case of political prisoners, escape is also part of politics: you escape to rejoin the movement and also, perhaps, to show what your movement is capable of. Not that everyone had much of a chance to escape. But in some regimes, political prisoners seem to spend most of their time devising jailbreaks. This was certainly true in Ireland during the years of the Revolution and Civil War (1916-1923). Page 99 features a postcard from 1919, showing Irish revolutionaries merrily escaping en masse from Mountjoy Prison in Dublin, while a little boy alerts the clueless guard. The Irish Free State that took over the prisons and camps in 1921 did not have more success holding on to the men and women they detained. We see Sean MacBride—future winner of the Nobel Peace Prize for his work on human rights, but in 1923 a lowly IRA soldier—given the task, in Newbridge Camp near Dublin, of managing the multiple escape schemes being hatched by his fellow prisoners, in order to identify those with the best chance of success. Thus escape became proof of the IRA’s organizational superiority. I understand the political prisoner as someone who develops a politics of the prison: that is, who sees the fact of being imprisoned as an opportunity to advance one’s cause. The men in Mountjoy Prison and Newbridge Camp, as well as those I portray in prisons and camps ranging from Stalinist Poland to Apartheid South Africa to Guantanamo Bay, demonstrate this very well. Learn more about Dance in Chains at the Oxford University Press website. My latest book, Island of the Blue Foxes: Disaster and Triumph on the World’s Greatest Scientific Expedition is about the mighty decade long Great Northern Expedition, conceived by Russia’s Peter the Great in the early 18th century. It was the most ambitious and well-financed scientific expedition in history, lasting nearly ten years and spanning three continents, its geographic, cartographic and natural history accomplishments are on par with James Cook’s famous voyages and Lewis and Clark’s cross-continental trek. The expedition involved thousands of scientists, artists, surveyors, naval officers, mariners, soldiers, and skilled laborers, all of whom had to cross through Siberia (which had no roads or accurate maps at the time), build a shipyard from scratch in Kamchatka, then build two ships, before setting off across the North Pacific to Alaska. It was a hugely important undertaking both politically and scientifically – Siberia was charted and a route across it formalized, while it laid the foundation for the Russian Empire to conquer Alaska (before selling it to the US over a century later). But it was also one of the Age of Sail’s darkest tales of shipwreck, suffering and survival. Page 99 does convey something of the content of the book – the adventurous events of a sea voyage – but it doesn’t get to the meat of the story, neither politically with Peter the Great in St. Petersburg, nor scientifically with the German naturalist and physician Georg Steller, nor nautically with the lurid and dramatic shipwreck, nor adventurously with the demoralized group’s survival on an uninhabited island. So this time I’d have to say sorry Ford Madox Ford, no dice, as they say. 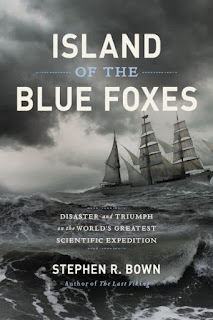 My Book, The Movie: Island of the Blue Foxes. Writers Read: Stephen R. Bown. It is this juxtaposition between how we, as a nation, have chosen to remember our shared cultural heritage and how things actually were, and continue to be. 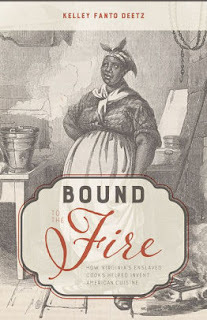 Misrepresentations baked in generations of racism and exploited labor have led us to not just misremember, but to forget the contributions of enslaved African Americans to our culinary history. Page 99 sits at the crossroads of race, gender, and memory and represents the greater point of the book; enslaved cooks and West African foodways were central to the creation of American cuisine, and its due time to give credit where credit is due. My Book, The Movie: Bound to the Fire. Helen Fry's "The London Cage"
Historian and biographer Helen Fry is the author of more than twenty books focusing mainly on intelligence, prisoners of war, and the social history of World War II. She lives in London. 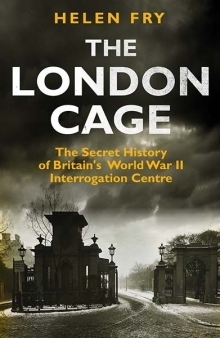 Few stories of the Second World War have been as controversial as the London Cage – the secret wartime interrogation centre run by British intelligence from three luxury stately houses in a road parallel to Kensington Palace. The street was Kensington Palace Gardens, still known today as ‘Millionaire’s Row’, and the most unlikeliest of places to hold German prisoners of war. But their quarters were far from luxurious – the once grand rooms of Nos. 6-7 and Nos. 8 and 8a were stripped of their opulent furniture, carpets and priceless art and turned into a harsh interrogation centre. Applying Test 99 to The London Cage gets to the heart of one of my major revelations – that the intelligence services were using ‘truth drugs’ on enemy prisoners at least a decade before the Cold War. Page 99 lands at the controversial point in 1941 and 1942 when MI6 – the British Secret Service – was holding Rudolf Hess (Hitler’s deputy) in a secret location after his failed solo flight to Britain in May 1941. ‘Truth drugs’ were administered to him in the belief he might spill some of the closely guarded secrets of the Third Reich. I place the Hess drugging episodes within the wider context of the experimental use of ‘truth drugs’ at the London Cage. The intelligence services were using a combination of barbiturates, amphetamines and hypnosis on its prisoners in an attempt to ‘break their will to resist’ and induce them to speak the truth in interrogation. The discussion about Hess comes immediately after an incident in 1940 when Colonel Alexander Scotland, the commanding officer of the London Cage, arrived at another interrogation site to inject a prisoner with ‘truth serum’. In that instance, Colonel Scotland hoped to ‘turn’ a captured German spy into a double agent for Britain. He failed and was banned from ever entering that site again. Truth drugs are of course not the only controversial revelation in the book – I'm interested in the four mysterious ‘suicides’ and try to get to the root of their deaths. I succeed in revealing the names of two of them for the first time. At the end of the war, the London Cage became the most important war crimes unit outside Germany and was responsible for bringing some of the worst Nazi war criminals to justice by a painstaking, forensic gathering of evidence for the trials. These interrogations were not without their controversy either. Returning to the core of page 99, did Colonel Scotland sanction the use of ‘truth drugs’ on Nazi war criminals to gain their confessions? Probably not, but it would appear that he crossed a line even further and allegedly used brutality, and forms of torture on them – physical and psychological. Had the tables turned such that Colonel Scotland himself was now guilty of war crimes? Issues raised by page 99 are still relevant today – posing challenges in this age of global terrorism for both opponents and exponents of torture. Cathy Gere's "Pain, Pleasure, and the Greater Good"
Cathy Gere is associate professor of history at the University of California, San Diego, and the author of Knossos and the Prophets of Modernism and the newly released Pain, Pleasure, and the Greater Good: From the Panopticon to the Skinner Box and Beyond. Page 99 of Pain, Pleasure, and the Greater Good is the first page of Chapter 3, entitled “Nasty, British, and Short.” My terrible pun on Thomas Hobbes’s famous phrase ‘nasty brutish and short’ is actually a serious statement. The book is about the psychology of pain and pleasure, which originated with Hobbes’s Leviathan, and became more and more influential in England and Scotland through the succeeding centuries. Chapter 3 is about the early-nineteenth-century version, as proposed by Thomas Malthus and Jeremy Bentham. The point of changing ‘brutish’ to ‘British’ is that pain-pleasure psychology always presents itself as being about the true brutish nature of the human animal, but in fact, it inevitably reflects very specific geographical, economic and political conditions, in this case British laissez-faire capitalism, rampant industrialization, and poor law reform. 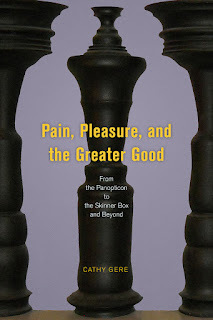 Learn more about Pain, Pleasure, and the Greater Good at the University of Chicago Press website. The Page 99 Test: Knossos and the Prophets of Modernism. Kevin Carrico's "The Great Han"
When the Qin Emperor founded the first unified Chinese state, Han Clothing was there. When the great inventions of paper, gunpowder, and the compass were discovered, Han Clothing was there. When Emperor Taizong reigned over the golden age of the Tang, Han Clothing was there. And when Zhu Yuanzhang led the victorious establishment of the Ming after the Yuan invasion, Han Clothing was there, just as it was when Koxinga gave all that he could to resist the murderous Qing. And having been there at these moments, it is also here in the present, providing a link from these moments in the past today… According to movement mythologies, the sole remnants in the Yellow Emperor’s tomb today are his Han Clothing: such permanence and stability is lacking in every aspect of real human existence, yet is imaginarily given concrete form in Han Clothing. Such transcendent stability and indeed immortality is particularly resonant in an era of unpredictable and destabilizing change, as we see in China today, in which identity not only faces the usual existential challenge of its own impossibility but the further challenges of increasingly rapid sociocultural transformation. The Great Han is an ethnographic study of the Han Clothing Movement (Hanfu yundong), a popular nationalist group that has emerged in cities across China in the decade and a half since 2001. Members of this group promote a purportedly eternal style of “traditional clothing” that they imagine was worn through history by members of the Han nationality, China’s majority constituting 92% of the population, until it was lost in early modernity. Revitalizing this apparel for the Han majority, then, is viewed as a way to revitalize authentic Chinese culture against the depredations of China’s painfully long nineteenth and twentieth centuries. This narrative, however, not only misrepresents history, but also the movement’s driving forces in the present. The Han nationality is a thoroughly modern concept, and Han Clothing, while presented as a timeless tradition, is in fact a very recent invented tradition. Therefore, rather than tracing the revitalization of lost authenticity, The Great Han finds the origins of these constructions of history and tradition located firmly in the contradictions of life in the present. 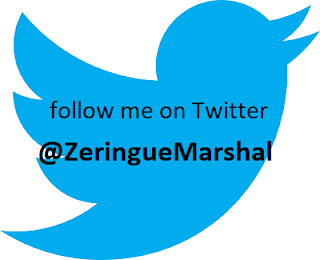 In this book, I focus in particular upon the relationship between socio-political processes and individual experiences. Although recent developments in China are often glossed as “China’s rise,” individual experiences of this rise are considerably more complex: new opportunities also produce new anxieties and uncertainties. Based upon my research in cities across China, I profile a number of participants in this movement, providing a glimpse of how the alter egos they construct therein, presented as their genuine selves, are in fact fantasies of the self that imaginarily invert real-life challenges and uncertainties, while legitimizing these imaginings through the ideas of “culture” and “tradition.” Participants, in short, imaginarily transcend their mundane living environment by constructing an alternate fantasy reality that is presented as more genuine and thus real than reality itself. This is where we find ourselves on page 99. In an era of disillusioning modernity plagued by uncertainties and anxieties, the threads of Han Clothing functions provide links to a more authentic, more peaceful, and genuinely prouder time in the past: what participants call “the real China.” Most importantly, these metaphorically laden threads can now be held and indeed possessed as one’s very own. In contrast to a disillusioning reality constantly slipping out from beyond one’s control, Han Clothing thus provides a stable and indeed possessible link to an inverted fantasy world presented as one’s authentic self. 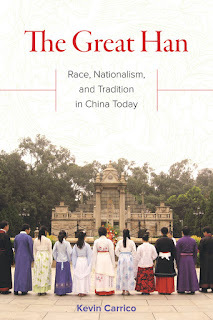 Learn more about The Great Han at the University of California Press website. Randolph Lewis is a professor of American studies at the University of Texas at Austin. He has written extensively on how visual culture shapes our sense of the nation, often focusing on people who work outside the cultural mainstream. His books include Navajo Talking Picture: Cinema on Native Ground. The page 99 test is useful for my new book, which is about living in a society making unprecedented investments in surveillance technologies. The page in question is part of a chapter called “Growing Up Observed” that deals with the strange ways we get accustomed to (or hostile to) invasive monitoring during our earliest years. What makes us sensitive to being watched is not a question that scholars have been able to really answer, and I don’t make any definitive claims in this essayistic chapter. Instead, I’m considering some ways of thinking about the topic that might help readers to understand their own attitudes about the NSA, drones, Big Data, and other forms of surveillance that the book explores. Moreover, page 99 is not just about childhood and surveillance, which is a fascinating topic in the era of “Elf on the Shelf”, but also a reflection of the personal nature of this book. While the various chapters on surveillance in nature, churches, or media gently touch on my own experiences, “Growing Up Observed” has a short section that draws on my own life in some detail. That makes page 99 the most personal part of a fairly personal project, and in that sense it’s quite revealing about the origin and deeper nature of the book. Yet am I really writing about myself on page 99 and the pages nearby? Yes and no: mostly it is my attempt to think through the subtle things that make us sensitive, or not, to this vast organizing force in the world today. That was my goal at least. Finally, I would say something about the writing style that I noticed when I flipped to page 99. Happily, for me at least, the writing on page 99 feels a little more vibrant and personal than the academic work I did in my younger years. Frankly, to the extent that authors can say such a thing about their own books, page 99 seems written with the sort of care and warmth that I hope is characteristic of the book as a whole. So in that sense, I hope the reader of the book gets something that page 99 seems to promise: big questions and subtle insights about a subject of great urgency, written in clear prose with a gently philosophical bent. 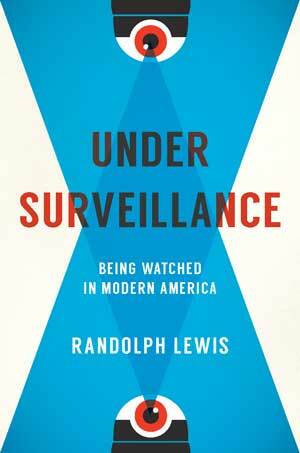 Learn more about Under Surveillance at the University of Texas Press website. Daniel Swift teaches at the New College of the Humanities in London. His first book, Bomber County, was longlisted for the Samuel Johnson Prize and the Guardian First Book award, and his essays and reviews have appeared in the New York Times, the New Statesman, and Harper’s. 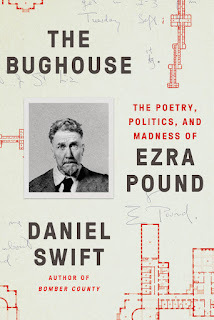 Page 99 is the heart of my book The Bughouse, for this is the page on which I describe Pound’s room on Chestnut Ward of St Elizabeths federal hospital for the insane. Pound spent a decade in this room, as a patient at the hospital between 1945 and 1958, and here he met with the many poets, artists, political activists, and students who came to visit him. 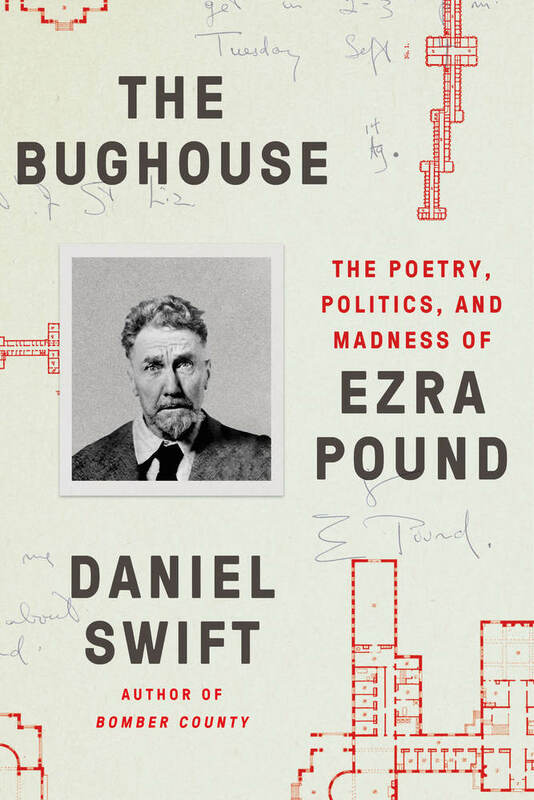 He was, in his years at St Elizabeths, a most provocative figure: a great poetic genius and a patient in a mental hospital; a traitor and a madman; a fascist, a teacher, and a fool. This ward, and this room, were his setting, and here he played so many roles. What is the room like? It is not big but nor is it a prison cell. It is perhaps ten feet by twenty, with two windows which look out upon the trees and lawns which surround St Elizabeths. It has heavy blue wallpaper which is peeling now, and it is no different, really, from the ten other rooms on the ward. No different except this one is the scene of what is perhaps the world’s most unorthodox literary salon: convened by a fascist, held in a lunatic asylum, with chocolate brownies and mayonnaise sandwiches served for tea. Learn more about The Bughouse at the publisher's website. The Page 99 Test: Shakespeare's Common Prayers. John Sharples's "A Cultural History of Chess-Players"
John Sharples is a cultural historian. He completed his PhD at Lancaster University. He has published on the chess-player, flying saucers, and Jules Verne. My book puts forward the idea of the chess-player as a fragmented cultural figure. In an attempt to engage with the various forms of its subject, it is divided into three sections – Minds, Machines, and Monsters. The thought that a solitary page could encapsulate the entire work’s themes was an intriguing one. Despite initial doubts, it arguably does do so. 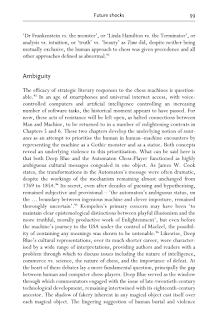 Page 99 comes from the concluding remarks of chapter four, entitled ‘Future Shocks: IBM's Deep Blue and the Automaton Chess-Player, 1997-1769.’ This chapter examines a range of cultural responses to Garry Kasparov's 1997 defeat by the IBM supercomputer Deep Blue and to Wolfgang von Kempelen's eighteenth-century Automaton Chess-Player. By suggesting that ‘both Deep Blue and the Automaton Chess-Player functioned as highly ambiguous cultural messages congealed in one object’, I frame the chess-player as a kaleidoscopic cultural figure capable of generating multiple meanings. This is the main theme of the whole work. Other chapters apply this theme to chess-player forms including the human, animal, child-prodigy, and super-villain, utilising comics, detective fiction, sci-fi, and film. 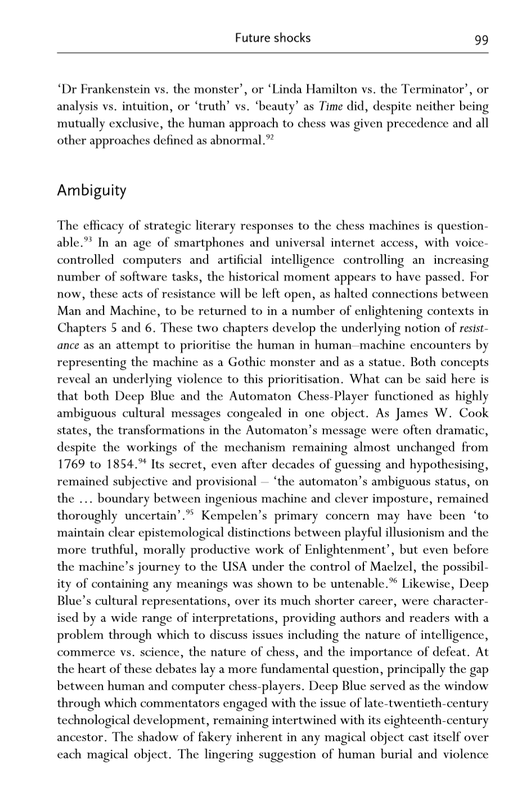 On page 99, I conclude by summarising some of the ways cultural construction occurs and consider the efficacy of the crude binary oppositions which have been used to assert the superiority of the human chess-player over machine counterparts. Characterisations of Kasparov’s contest as ‘Linda Hamilton vs. the Terminator’, for example, raise questions of historical timeliness and cultural power. In an age of pervasive computer systems, the ‘historical moment’ of the chess-player as a figure of reason and intelligence may have passed. This thought is amplified elsewhere throughout the book, in the context of a number of more disreputable, more monstrous, and more Gothic theoretical readings of the human chess-player. These themes are closely linked to chapter four’s readings of the machine chess-player, particularly the idea of the chess-player as a statue, often static and frequently isolated in performance, and the way the chess-player is viewed as a distant emblem of ‘intelligence’ and ‘reason’ under the gaze of others. In this regard, the ‘quality of the whole’ work is revealed on this single page. 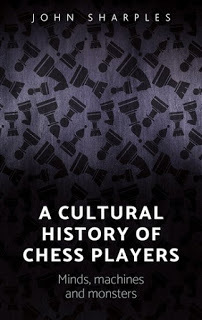 Learn more about A cultural history of chess-players at the publisher's website. Francesco Duina's "Broke and Patriotic"
Francesco Duina is Professor of Sociology at Bates College, as well as Honorary Professor of Sociology at the University of British Columbia and Visiting Professor of Business and Politics at the Copenhagen Business School. He is the author of several books, including Winning: Reflections on an American Obsession. The country does enough.... They feed you, they give you free housing, they give you food stamps ... the country does a lot for their people. The United States do a lot for their people. If you can’t make it here, you can’t make it nowhere.... If you can’t make it here, you ... you ... there’s something wrong with you ... there’s something terribly wrong with you. ... Yeah, he [my father] taught me that. It’s the land of opportunity to be what you wanna be. I helped you so far, and you have to help yourself. Page 99 is one of many where the reader hears the thoughts and beliefs of some of America’s economically worst-off people as they describe their intense love of country. This is Chapter 3, where the attention turns to the widely-held conviction that America is great – indeed superior to other countries – because it is so wealthy and because anyone can make it there. When I questioned my interviewees about their own, often very difficult, trajectories in life, the answer was consistently one of personal responsibility: their dire circumstances were the results of their own choices, they told me, not anyone else’s – much like wealthy people have become so because they have earned it. So, why blame the country for anything? On the contrary, they expressed gratitude to the many organizations that help them eat and sleep with a roof over their heads. The other core chapters of the book explore two parallel ideas driving the intense patriotism of America’s most impoverished citizens. The first is a sense that America represents hope for mankind in general and, in turn, for themselves individually. When nearly everything else has gone wrong in life, pride in being American can give one a powerful sense of dignity. This is the land where every person counts, every human being is sacred. The second idea involves freedom. America is the land of physical and mental freedom. The extent of that freedom, according to them, is unique. Here, discussions about God (freedom of religion) and guns often came up. Misconceptions about other countries, and America itself, certainly abounded. The lessons I learned from my travels and conversations, however, made clear to me that those were not really very relevant for my interviewee’s devotion to their country. In the end, the most important thing was something else: it was a sense that this country (still) belongs to the people. 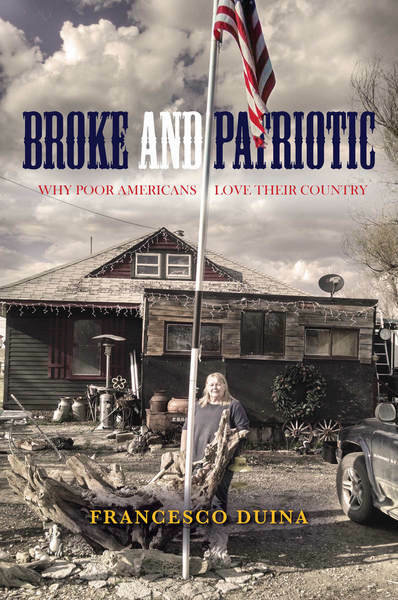 Learn more about Broke and Patriotic at the Stanford University Press website. The Page 99 Test: Winning.